When I think of city building games, I think of large, complex games, with details from public transport to your cities economy to take into account. Sort of like Sim City, but as a boardgame. Machi Koro, while undeniably a city building game, could not be further from that idea, it’s about as light as a game in this genre can possibly be. But nevertheless, it has a huge appeal. From the original Japanese edition, in 2012 it has spread all over the world and is now available in Dutch, English, Spanish, Russian, Korean and more. German, too, the German edition by Kosmos was nominated for Spiel des Jahres this year. And wherever Machi Koro appears, people love it. That justifies a closer look. Your city in Masao Suganuma’s game comes from truly humble origins: with just one Wheat Field and one Bakery, it hardly qualifies as a village at the start. To win the game, your city needs to have the four Monuments completed: the Station, the Shopping Mall, the Amusement Park, and the Radio Tower. That’s an ambitious goal, considering that you can just barely buy bread rolls right now. You better start heating up the economy. The economy in Machi Koro is also known as the die – later the two dice. 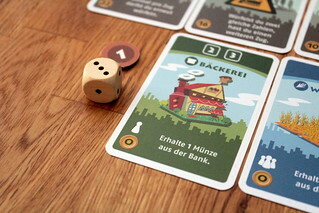 At the start of your turn, you always roll a die, then you activate all buildings showing the number rolled. 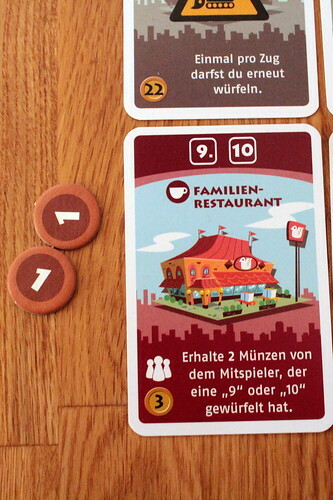 For your starting buildings, that means you activate the Bakery and take one coin whenever you roll a two or three, and you activate the Wheat Field and take one coin when anyone rolls a one. That only covers half the possible rolls, so it’s time to start expanding. After you roll and take your income, you may buy exactly one new building per turn. Which buildings to buy, however, is not so easily decided. It’s tempting to fill up the numbers first and buy buildings that are activated on four, five or six, so that every possible roll has a benefit for you. That’s certainly one way to look at it, but you could also favor the blue buildings that, like the Wheat Field, activate whenever anyone rolls their number, not only on your turn. But then you might not get all the numbers. Or, if you think friends are overrated anyway, you build red buildings. They only activate when another player rolls their number, but then you take money from them, not from the bank. That theft can be really, really annoying if you just keep rolling threes, the number of the red Café. Long term planning should enter your building strategy, too. As soon as you build the Station, you may choose to roll two dice instead of one and then use their sum. Obviously, that means your Wheat Fields won’t be seeing any action, rolling a one with the sum of two dice is unlikely, but there’s a whole new range of buildings with numbers from seven to twelve that you can activate with two dice, if you built them. Having a long term plan is important here because two of those buildings, the Furniture Factory and the Fruit & Veggie Market, profit from your smaller buildings. The Market generates two income for every building showing an ear of grain. That includes Wheat Fields, so they’re not useless when you roll with two dice. The Factory does the same for cards with a cog icon. Of course, you don’t have to build either of those, you can also specialize in Mines and take five coins per Mine every time anyone rolls a nine. Or, if you still have too many friends, you build Restaurants and take even more money from the other players. Whichever way you choose to generate income, you want to do it quickly. The monuments’ prices seem almost unachievable at the start, the Radio Tower costs 22 moneys to build, but someone can generally get there more quickly than you thought possible. And as soon as the first player builds his final monument, the game ends. No extra round, no tie breaker, it’s game over at that point. A sad consequence of this short and quick game is that the one building that doesn’t generate income, the Business Center, is rarely worth taking. It would let you swap one of your cards for a card from another player, which is both fun and useful in theory, but is always weaker than having a card that makes money for you on the same roll, like a Stadium. The one thing you do in Machi Koro, then, is optimize your city for the most income per round. There are a number of ways to do that and you can try different ways to make money quickly each new game. That’s fun for a while, but in the end they all depend on the roll of the die. And while managing that luck is the point of the game, you can be screwed by bad rolls with no chance to prevent it, like always when everything depends on the roll of the die. I’m okay with that for a game as quick as Machi Koro, but I know not everyone is. And when, on top of that, you keep giving your money to the other players’ Cafés and Restaurants, then Machi Koro can be somewhat frustrating. Personally, I like this game as a light filler. It’s short, it has little downtime, and an amount of luck that seems appropriate for the game’s lightness. I’m not a big fan of the buildings that steal money from others, but since that money can only come your savings and not from this round’s income, it mostly doesn’t leave without money and nothing to do for the round, softening the impact a little. Still, I wish there was some more constructive form of interaction. My larger concern is with replayability; there are different options how to make money, but after a few games you have tried all the more promising ones and have bought all the cards at least once. The two available expansions probably rejuvenate it for a while, and they might even add a bit of complexity to this very light game, but since I didn’t play with either of them I can’t say that for sure. Only the whole, I liked Machi Koro. It is a good filler game and should play very well with kids, but seeing how much love it got everywhere and its Spiel des Jahres nomination, I expected more.